Media Archives - Page 2 of 6 - Affiliated Monitors Inc.
–The conference focused on the action piece of what compliance professionals need to accomplish. –A key theme which literally began on the first keynote on the first day, from Patrick Quinlan, CEO of Convercent was organizational justice. Feldman believes that this is not enough discussed at compliance conferences as it serves as a foundation for credibility of senior leadership in an organization and helps drive a strong ethical culture throughout a company. –Another interesting concept discussed by Feldman and myself was brand reputation and brand protection, another key theme at the conference. Day 1: In part 1 of this 5-part series on mergers and acquisitions, Eric Feldman and Tom Fox discuss the why’s, what’s and how’s of an independent assessment of a target. Listen below, or on the FCPA Compliance Report. Day 2: Don Stern discuss the impact that M&A has on both the acquired entity and the acquirer. Listen below, or on the FCPA Compliance Report. 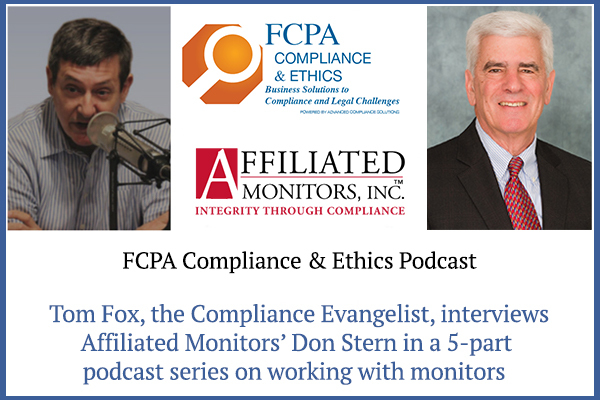 Day 3: In this 5-part series, Tom Fox, Eric Feldman, and Don Stern, and Rod Grandon explore how to go about assessing ethics and compliance in the mergers and acquisition (M&A) context. In this third episode Fox visits with Feldman about planning out a post-acquisition merger strategy. 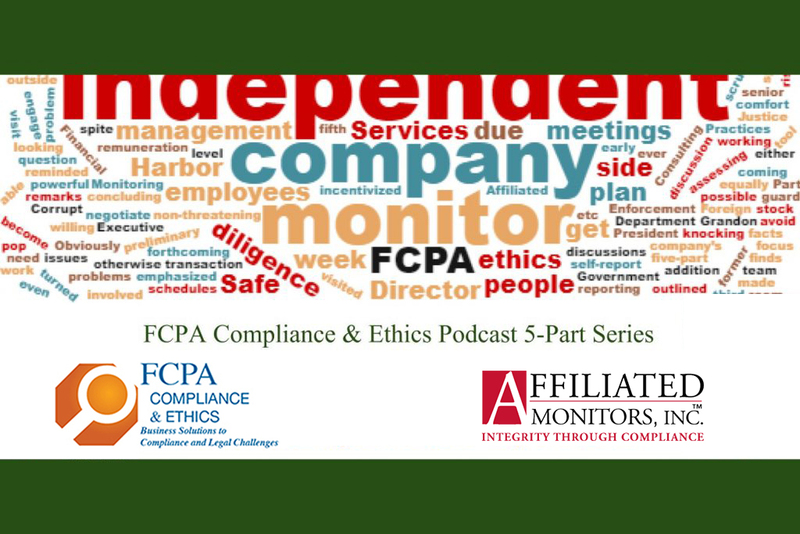 Listen below, or on the FCPA Compliance Report. Rules aren’t always enough. Your employees need to be committed to compliance, and your company culture has everything to do with it. 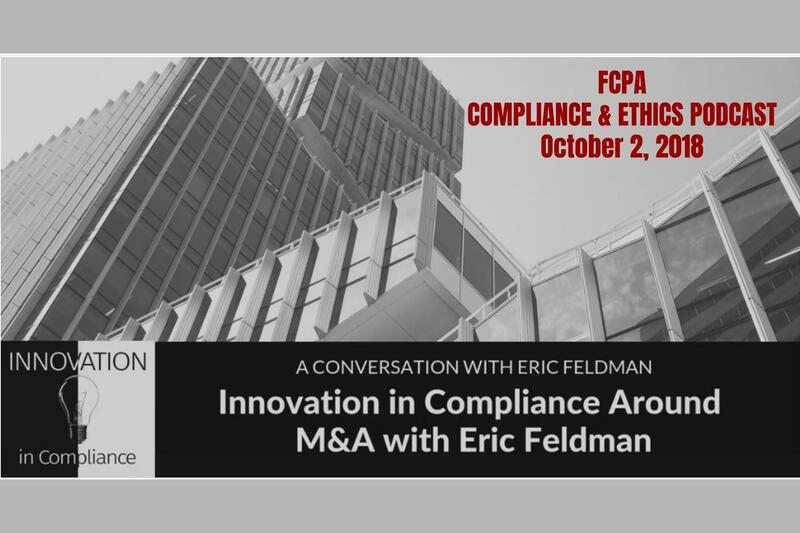 Recently, Eric Feldman was invited to join Tom Fox on his podcast Innovation in Compliance, to share Feldman’s expertise on mergers and acquisitions, especially on how to mitigate risk when merging with or acquiring companies with FCPA violations. After 32 years in government oversight and federal auditing, Eric decided to join Affiliated Monitors in 2011. Affiliated Monitors is an independent integrity monitoring service that helps companies reduce their risk of ethical failures by conducting comprehensive assessments of company ethics and integrity programs and measuring their impact on compliance, culture, and activities. 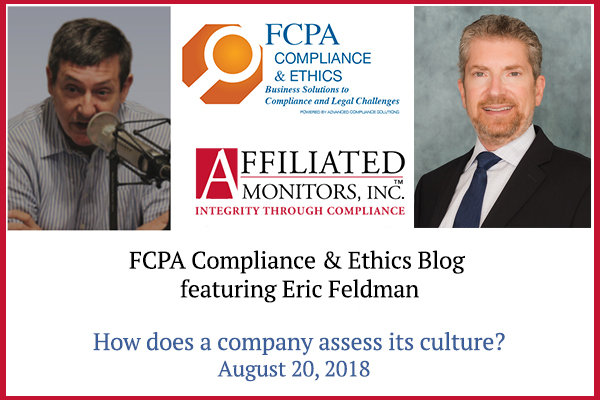 Eric Feldman, Senior Vice President and Managing Director of the Corporate Ethics & Compliance Programs, was interviewed for the October 2018 issue of Compliance & Ethics Professional–A Publication of the Society of Corporate Compliance and Ethics. The interviewer was Gerry Zack, Incoming CEO of SCCE & HCCA, based in Minneapolis, MN. The interview covered a multitude of topics, like lessons learned during Feldman’s time in the federal government and thoughts on his transition into independent monitoring. 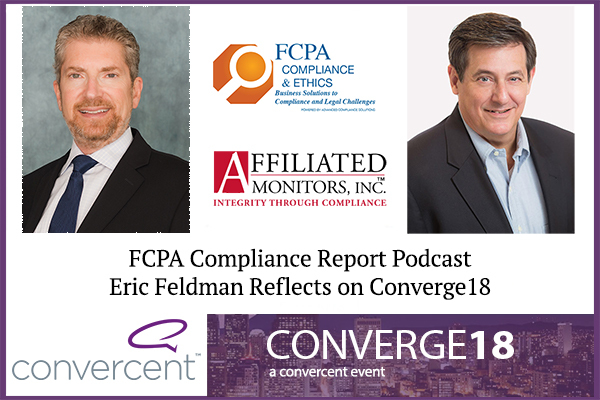 Read the full interview below to hear Feldman’s thoughts on the most common issues found during a risk assessment as well as insights on the changing field of compliance and ethics programs. 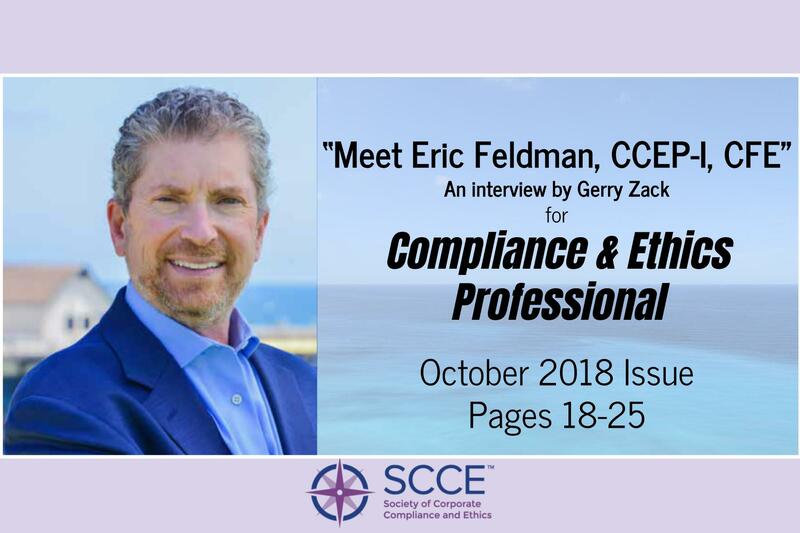 To download the interview, please click here: “Meet Eric Feldman.” An interview by Gerry Zack For Compliance & Ethics Professional: Copyright 2018 Compliance & Ethics Professional, a publication of the Society for Corporate Compliance and Ethics (SCCE), pp 18-25. Day 3: Eric Feldman and Tom Fox continue this 5-part series on corporate culture. Their conversation centers around the role of a CCO in strengthening and driving the ethical culture of an organization. Day4: Tom Fox and Catherine Keyes continue this 5-part series on monitoring in the healthcare industry. 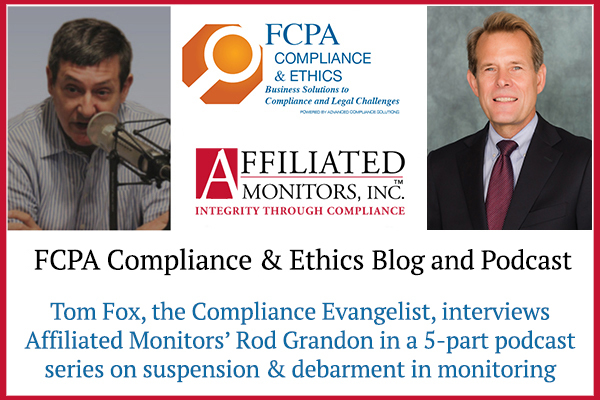 Day 4: Tom Fox and Rod Grandon continue their 5-part series on suspension & debarment in monitoring. 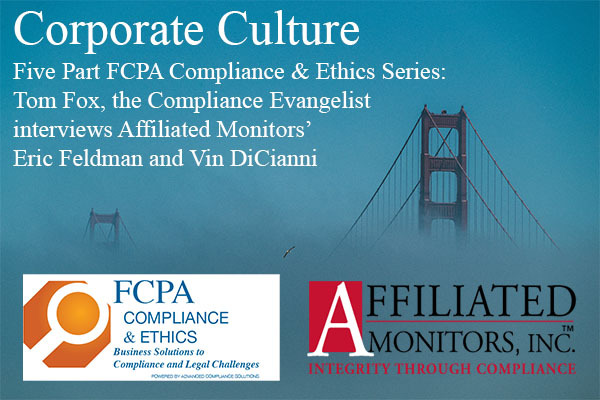 Day 1: In day 1 of this 5-part series on corporate monitorships, Vin DiCianni and Tom Fox discuss the basics. What is a corporate monitorship? 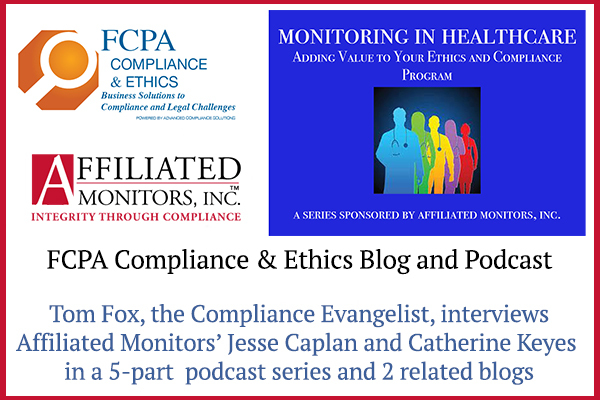 Day 2: In part 2 of this 5-part series on corporate monitorships, Eric Feldman and Tom Fox consider: what is a post-resolution monitorship? 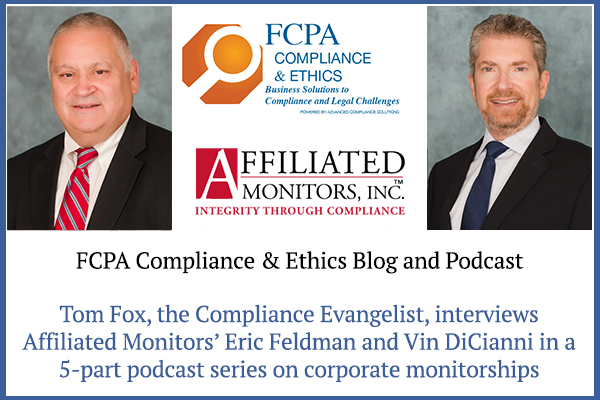 Day 3: In part 3 of this 5-part series on corporate monitorships, Eric Feldman joins Tom Fox to consider the power of a pre-settlement monitorship. Day 4: In part 4 of this 5-part series on corporate monitorships, we consider what issues a company should consider when hiring or retaining a corporate monitor.